You will recollect that the Federal Government entered into an asset finance arrangement with bank of industry to purchase device. That arrangement had been concluded at the end of July 2018. So, 2016 Beneficiaries, those devices are utterly and totally yours now. The device are no longer the property of N-power. 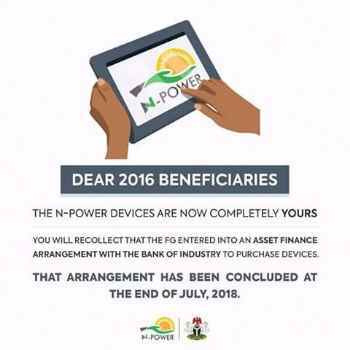 This simply means that the money Npower has been deducted from your stipends for past 5month for your device ends in the month of July and no more deduction of stipends.